Thank Goodness It’s Falafel-day! Just as much as we are excited about Fridays, we are excited falafels as well. Why? Because Team Daily loves food! These tiny dumplings of perfection are a blessing to your tastebuds. There’s nothing like devouring these delicious, supernatural dumplings that instantly satisfy hunger, look amazing and taste even better. Whether in a wrap, in a sandwich or on their own, this Middle Eastern delicacy is more like street food but can be enjoyed whenever, how ever and where ever. The ingredients of falafel do not largely vary and primarily include chickpeas, fava beans and spices. What really varies are the spices and that makes all the difference. Craving for some already? We are here to help, as always. Jam Jar – Oh, Jam? Jar? Yes, Jam Jar. Hold on, this place is not about jams but instead authentic Lebanese food. 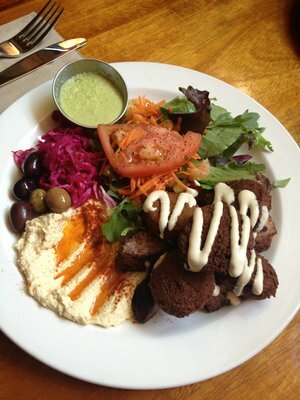 Located on Commercial Drive, this restaurant serves falafel both in a wrap as well as in a platter. The potato munchies served with the falafel plate spell Y-U-M! Nuba – With locations in Yaletown, Gastown and Mount Pleasant, it is impossible to not know Nuba if you are a true foodie! Their Falafel lunch platter steals the show. Olives, hummus, salad and falafel, this is the real deal, we say. Koala Kebabs – Falafel platter with rice? Yes, please! Their falafel wrap is a Downtown star but the platter is even better. The bigger, the better, you see 😉 Oh, you get to choose your sauces, btw. Hummus, Garlic Mayo, Spicy Mango, mmmm, choices are plenty to choose wisely. Mediterranean Greens Salad Bar – Salad Bar? Looks can be deceptive. Another Downtown star, their falafel platter comes with pita bread. Yay! for all bread lovers. A fulfilling meal, have it slowly to enjoy every single bite. Falafel King – Doesn’t the name say it all? Their falafel sandwich comes with your choice of soup or salad. Carrot or lentil soup? Either one because they both taste perfect with their wrap. With so many options to choose from, how about we have falafel everyday for the next few days?! (Yeah, just one Friday in a week dedicated to them is so not enough).